Sam’s Subtle Light-Blue Striped shirt is sometimes completely hidden under all his layers, and the only way you can glimpse it is the very top of the collar. It is striped in differing shades of blue, with differing broadness of stripe, but most notable is the two very broad darker stripes close to the center of the chest – these can usually be seen through the opening of a jacket. It has no breast pockets and does up with buttons. In Dead In The Water (1x03), Sam is wearing the light blue striped shirt in the scene at the beginning of the episode when he and Dean are in the diner. In Phantom Traveler (1x04), Sam wears the light blue striped shirt from the beginning of the episode, up until the point where he and Dean have to put on suits. In Bloody Mary (1x05), Sam wears this shirt for the customary goodbye scene at the end of the episode, and therefore, is still wearing it when he thinks he sees Jessica at the side of the road. In Skin (1x06), this is the shirt Sam wears to visit Becky. He wears it to the crime scene and when reviewing the security tape at Becky’s house with Dean. In Bugs (1x09), Sam once again chooses to wear this shirt when saying goodbye to the rescued family at the end of the episode. 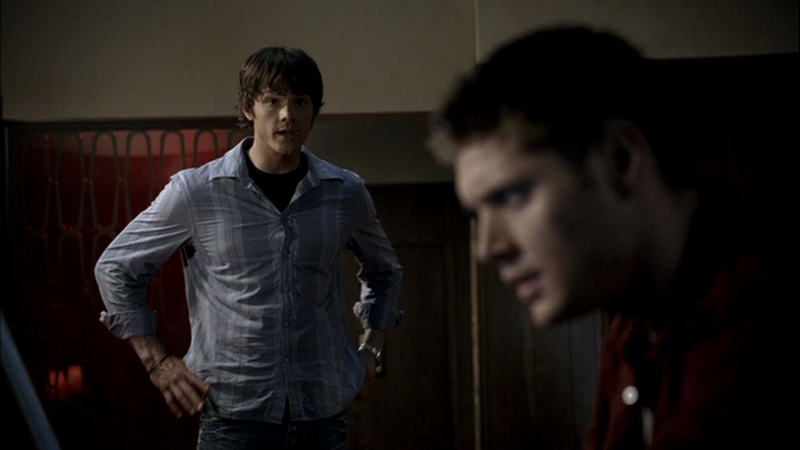 In Asylum (1x10), Sam is wearing this shirt in the beginning of the episode while arguing with Dean about whether their Dad is even still alive. He keeps it on while he questions the cop in Rockford. 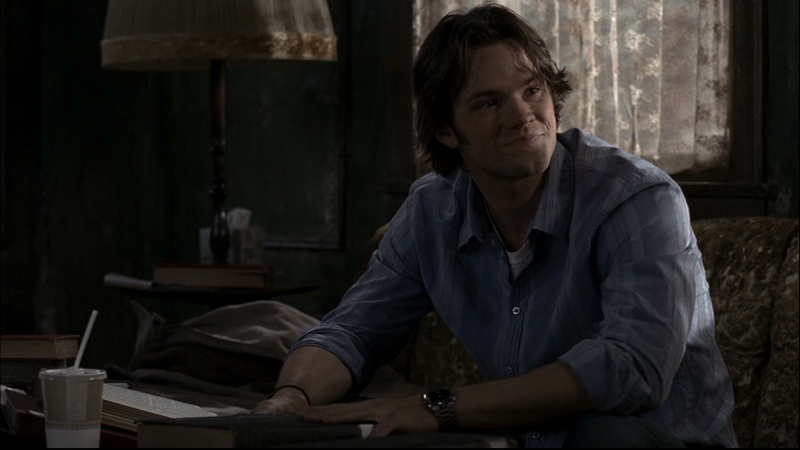 In Tall Tales (2x15), Sam wears it while he and Dean recount their week to Bobby. In the flashbacks, we see him start wearing it from the alien abduction onward. He changes before they go after the trickster though. In Criss Angel Is A Douche Bag (4x12), Sam wears it at the end of the episode, when they try to thank Jay and he is all depressing. This post is missing its tag. It looks like the S1 incarnation didn't quite fit, so they had to buy a bigger shirt. What episode is the first cap from?